Step 2: Open the hood and prop it up so you can easily access the engine. Step 3: Locate the oil dipstick. On most cars the dipstick has a yellow handle. It may be located at the front or near the center of the engine. Step 4: Pull out the dipstick and wipe it off with a clean towel. Step 6: Re-insert the dipstick, then pull it out once again. Step 7: Examine the oil level. There should be two marks on the dipstick indicating “add” and “full” levels. The oil you see should fall between these marks. If the oil is close to or lower than the “add” mark, the engine needs more oil. Step 8: Examine the color of the oil. Rub the oil on the dipstick between your fingers and look at the color. It should appear black or brown. 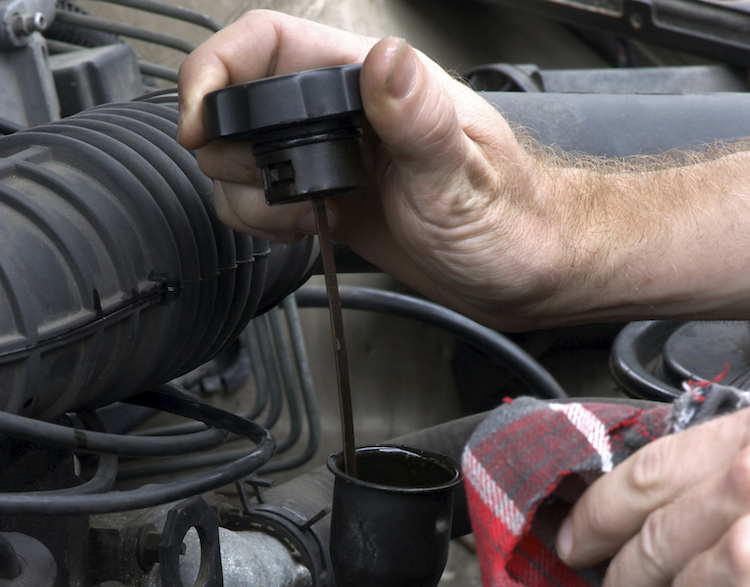 If it’s a lighter or milky color, this could indicate a coolant leak which should be repaired. If you feel any grittiness in the oil, it could indicate engine damage, in which case a mechanic should inspect the engine as soon as possible. If the dipstick indicates a low oil level, you will need to add more oil to the engine. Step 1: Buy the correct grade of oil, making sure to use the grade recommended in your owner’s manual. Step 2: Remove the oil filler cap, which is usually a screw cap on the top of the engine. Step 3: Using a funnel or carefully pouring directly into the fill hole, pour in a half-quart of oil. Step 5: Use a towel to wipe off any oil that may have spilled on the engine. Step 6: Replace the oil filler cap. Step 7: Close the hood. Your engine is now properly filled with oil and ready to drive. Checking your oil is a straightforward process essential to maintaining your engine. Remember to check your oil on a regular basis, and contact us if you experience any issues such as gritty oil, discolored oil, or consistently low oil levels, or if you’re simply due for an oil change.